A Single Bench of Kerala High Court presided over by Justice Dama Seshadri Naidu has doubted the correctness of the judgment rendered by a Division Bench led by the then Chief Justice of Kerala High Court, Dr. Manjula Chellur in the case of Jyothilal K. R. v. Mathai M.J., reported in 2014 (1) KLT 147. The Division Bench had held in that case that the contemnor need not appear until a notice is given by the Division Bench. It had further directed the Single Bench to refer matters pertaining to contempt to the Division Bench. The Judgment in Jyothilal was criticized by senior lawyers and former Judges alike. 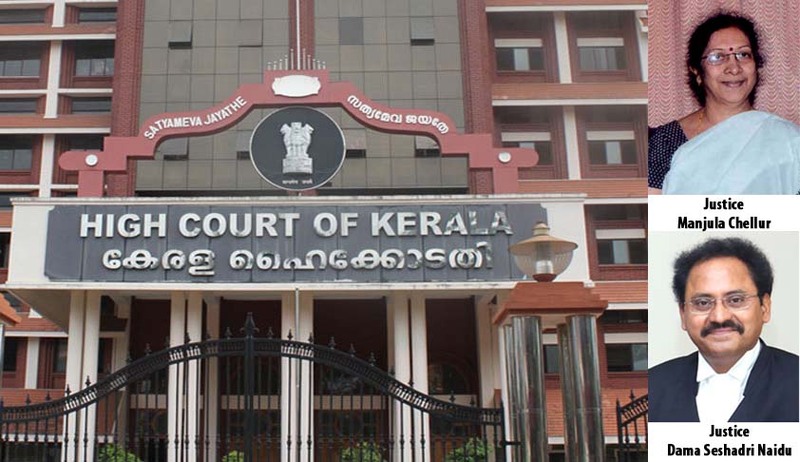 While deciding the Contempt Petition at hand, the Court’s attention was drawn to Contempt of Courts (High Court of Kerala) Rules and the case of Jyothilal, which was rendered by a larger Division Bench. The order was rendered after Justice Naidu observed incompatibility between Jothilal’s case and the statutory scheme under the Rules. The Registry was hence directed to place the case before the Acting Chief Justice for consideration and appropriate action. Initially, before the Single Judge for forming a prima facie opinion, after which, in the event either the contemnor has not tendered an apology or the one tendered has not been to the satisfaction of the Single Judge, the case will be referred to a Division Bench. opinion about the contempt, the third occasion arises. This will be the stage when the Division Bench takes cognizance of the contempt. Thus arises the need for issuing notice for the third time. Hence, Kerala High Court rules contemplate a dichotomy of adjudication. Jyothilal’s case however concludes that it is only a Division Bench which can initiate contempt proceedings and if it finds that no prima facie case is made out or if it differs in its opinion from that of the Single Judge with regard to the prima facie case, it can dismiss the contempt petition or drop the proceedings. Hence, as opposed to the Rules, Jyothilal’s case contemplates issuance of a notice only at the third stage (as indicated above), after the Division Bench has been satisfied that a prima facie case has been made out. According to Jyothilal, when the matter is placed before the Division Bench, unless the appearance is dispensed with, the contemnor is required to appear before the Court on every hearing. Till then there is no requirement for the appearance of the respondent contemnor especially for the limited purpose of making an enquiry whether a prima facie case is made out to refer the matter to a Division Bench or not. Now, according to the Rules, after prima facie satisfaction, a Judge is required to pass an order dispensing with the presence of the putative contemnor. However, going by Jyothilal, when no such power exists with the Judge before the stage of forming prima facie satisfaction, the question of his dispensing with it after prima facie satisfaction is formed, while issuing a notice would be contradicting. In the light of this discussion, Justice Naidu hence submitted that the decision of the Division Bench in Jyothilal is irreconcilable with the procedural parameters fixed by the Rules governing the contempt proceedings before the Court. The facts that lead to the Petition involved M.P. Verghese, Asst. Professor at Model Engineering College, Thrikakara, who filed a Writ Petition, ventilating his grievance that the Government, having granted the benefit of enhanced pay, now, after twelve years, is taking steps to withdraw the said benefit. The Petitioner had hence sought an interim direction which was granted in September, 2014. Through this direction, the order for recovery of excess salary paid, 12 years ago, was suspended for a period of 3 weeks. Despite communications of the order, the officials went ahead with the deductions from the petitioner’s salary. A contempt case was hence brought forward by the petitioner. The Government Pleader had requested to dispense with the presence of the contemnor. In this regard, the Government Pleader had submitted that a single Judge did not have the power to order the appearance of the contemnor and that it is only a Division Bench of the Court that had the power to do so, in the light of the contempt rules in force.